The Producer Mixing Workshop is a 4-hour in-person workshop taught by Dan “5PiECE” Lombardi. The workshop offers producers and engineers insight and instruction on how to get the most out of their instrumental mixes. Learn how to leave your listeners in awe by making your music sound the best it possibly can. Topics covered include setting levels, compression, EQ and using creative effects such as reverb, delay and more. This workshop will provide you with the techniques, tactics, and mindset required to create a compelling mix and your best music yet. For more information please visit the Producers Mixing Workshop page. The workshop takes place at Lynx Music Studio located at 260 Emerson Avenue in Toronto, Ontario, Canada. The workshop is 4 hours total. There will be a 20 minute intermission half-way through the workshop. Producers, beat-makers, and aspiring engineers who want to improve their producing, mixing and mastering skills when it comes to their own instrumentals. What style of music is this workshop best suited to? Rap, Hip Hop, Trap, Pop and R&B are the genres that this workshop caters to most. Other genres that are electronic and/or loop-based will still find helpful information here- but most of the information is specific to urban music. What DAW is used in the workshop? This workshop is taught in Pro Tools. I use a different DAW. Will this workshop still help me? Yes – this workshop will help you mix better regardless of DAW. The workshop is comprised of mixing strategies and techniques that you can use in any DAW environment including but not limited to FL Studio, Logic, Reason, Reaper, Cubase, etc. The key is to understand the concepts and find ways to apply them in your setup. The execution may be slightly different but the logic, understanding and knowledge is always the same. What plugins are used in the workshop? 5PiECE uses a variety of plugins with a particular emphasis on the ones that come standard with Pro Tools to show you don’t need fancy plugins to achieve a clean mix. Some additional plugins from FabFilter, Waves, iZotope, and Universal Audio may also be used within the workshop. I just started producing music- should I attend this workshop? This workshop is beneficial to producers who have been making beats and want to better understand how to mix, master and present them to the world. If you have yet to make any beats or produce any music – you may want to do that before enrolling in this workshop. Does this workshop show you how to produce music? No – this workshop shows you how to mix/master your music exclusively. Additional insight is provided on production, but this workshop is not meant to teach you how to produce. Does this workshop show you how to monetize production and make a living off beat-making? No. 5PiECE may mention and outline some ideas of how to monetize your craft but this workshop does not teach you how to make money with your production. The workshop exclusively teaches you how to mix and master your beats to hopefully catch the ears of your potential client. Turning that into a profit is up to you and the quality of your product overall. Does this workshop show you how to mix vocals? This workshop is focused on mixing and mastering instrumentals. Some concepts are applicable to vocals- however, this workshop does not explicitly show you how to mix vocals or full-songs. How is this workshop different from other courses & tutorials? The Mixing For Producers workshop is uniquely different from other courses in a number of ways. 1. Its a workshop designed specifically for producers with the end-goal of teaching them how to improve their mixing and mastering while making the best sounding music they possibly can without compromise. No fancy plugins or outboard gear required. 2. This workshop was designed (and refined) by 5PiECE, a professional producer and engineer who makes a living working in the music industry and who started off in the same spot as you less a decade ago. 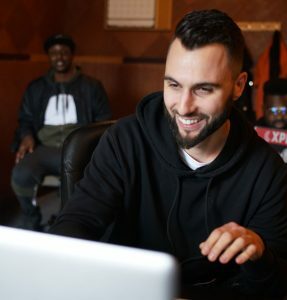 Through his formal education at the Metalworks Institute and learning opportunities from music production legends such as Noah “40” Shebib and !llmind, 5PiECE has the unique ability to pass on his learnings from some of music’s most talented people directly to you. 3. The aim of this workshop is not to instruct you on what to do in specific situations, but to teach you how to think and approach unique problems and solve them accordingly. There is no one solution in mixing- just about anything could work if done right. Perhaps its a tool or maybe its a technique- but the answer isn’t as important as you actually knowing what the problem is and understanding what to do about it. 4. This workshop focuses on urban music. Unlike other tutorials that are more open and focus on other genres such as rock, metal and country – this workshop is made for the urban music producer. Whether you make hip hop, trap or R&B, you will learn a lot in this workshop and find information that you cannot find anywhere else. Please refer below for a breakdown of the pricing.